Electric shavers are amply used by the men who want to give themselves a cool look at the home. 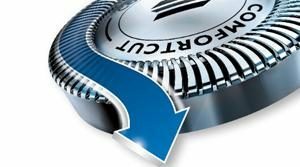 There are many such rotary shavers available in the market that are produced by different brands and make a buyer confused as to which one he should buy. One of the best electric shavers is the Philips AquaTouch AT899 Wet and Dry Men’s Electric Shaver which we are going to review today. You can use it for 45 minutes after charging it for a time span of 8 hours. It is 100% water-proof, because of the Aquatec seal Philips uses, and is thus easily usable in-shower with gel and foam. At the same time, it is suitable for out-of-shower shave too. It is fully washable and comes with quick-rinse system for a proper cleaning and maintenance. You can open up the head and rinse it out after use under the sink or in the shower. The triple head showers can adjust well to the contour of your face and thus ensure a gentle and close shave. It is equipped with ComfortCut blade system. It has a dimension of 2.8 x 5.5 x 8.8 inches. The weight of the product is 12. 6 oucnes. The model number of the item is AT899/16. It has an automatic voltage range of 100-240 V.
The stand-by power is less than 0.25 watt. The maximum power consumption here is 54 watt. Comes with standard 2 pin charger plug, 1 cleaning brush, 1 protection cap, and user manual. Was first manufactured in June 2013. You should replace the head every 2 years with the Philips Dual Precision HQ8/50 Replacement Shaving Heads. It allows you to enjoy a refreshing shave without having to worry about the damages in the skin. It is supposed to decrease nicks and cuts by 90%. It is suitable for both dry and wet shave. The rounded, low friction blades glide smoothly on the skin and prevent your skin from getting damaged. These low-friction blades glide smoothly along the contours of your face easily. The triple flexing heads move so it will follow the contours of your face also. It supports the use of foam and gel for extra skin protection. So, the chances of nicks and cuts on your skin are greatly reduced. It can be easily cleaned by opening the heads and putting them under the shower. The display is ideally designed for battery full indication, battery low indication and charge indication through the LED indicator. 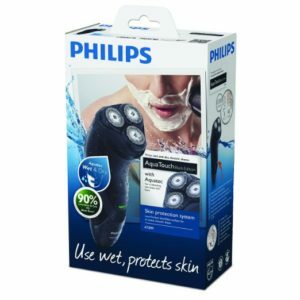 Philips offers a 24 month warranty on this electric razor for repair or exchange of it. The entire razor is made so if it were completely submerged in water it would stay completely sealed from water. This allows it to be used in the tub, as well, as in the shower. All Philips razors always use a rotary cutting system which allows you to get the most hairs cut while minimizing cuts and nicks. Philips calls this their ComfortCut technology. A few users have found some of the parts to be defective after prolonged use. Some people have called it to be a bit underpowered. It lacks some features as compared to the “stand-and-long” trimmers. The Philips AquaTouch AT899 Wet and Dry Men’s Electric Shaver is an appropriate shaver for those who want a safer shave without compromising with their look. The product has been able to satisfy many users with its functionality. Remember if you are transitioning from a straight razor to an electric razor it may take your skin a couple of weeks to get used to this. Give it a little time and the bumps should stop. It has an average of 4.2 out of 5 stars and has over 1400 reviews on Amazon with over 1150 being 4 stars or more, and currently sells for around £35. There are over 50 questions answered about this razor on its page in Amazon, if you have any specific questions not addressed here. This is a very solid electric shaver for the money, and with the 24 month warranty on it you are buying with very little risk while you use it. It is the #2 best-selling rotary shaver.